Keep your finger on the pulse of higher education by downloading the most recent student and employer demand trends for higher education. 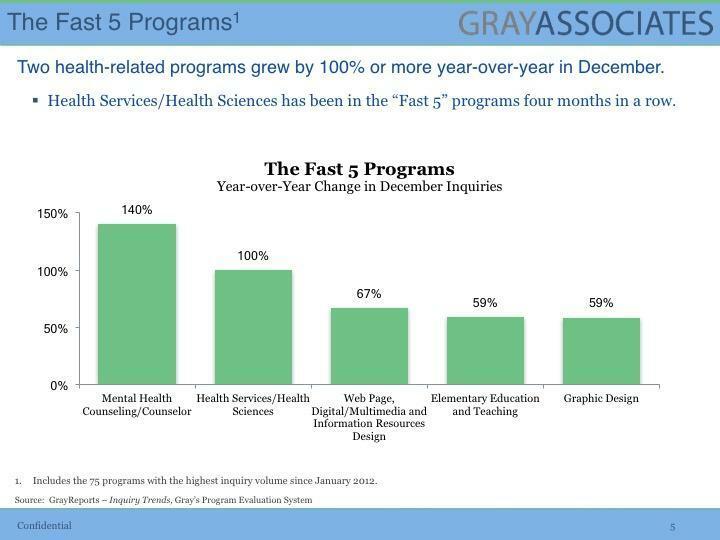 All of the trends that are uncovered during our monthly webcast are derived from Gray's Program Evaluation System (PES). PES supports the academic review process at all types of colleges and universities across the country. Were you unable to join the live webcast on January 24th? Please complete the form to download the presentation and watch a recording. Gray shares competitive insights on demand trends in higher education. For student demand, Gray reports year-over-year trends by location, modality, campus type, degree level, and program. For employment, Gray's real-time job postings from Burning Glass Technologies reveal the employment opportunities for every program. Are you interested in all of the data and trends that were released on our monthly webcast? Please fill out the form to download the report or watch a recording of our live webcast from January 24th.